Always assemble the drawer boxes before you assemble the cabinet case. Keep in mind that there is only one way to assemble each drawer box so human error is very unlikely. 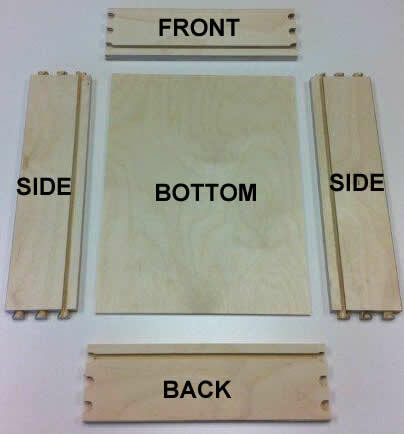 Regardless, lets do a tutorial on how to properly assemble a plywood drawer box just for fun! 2. 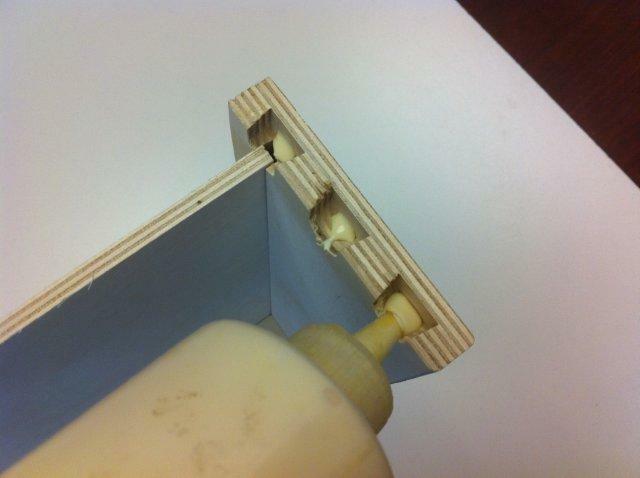 Take a front and apply a small drop of glue (any wood glue can be used Titebond #1 recommended, glue sold separately) to each dovetail pocket as shown below. Be sure not to apply more than a small drop to each pocket. 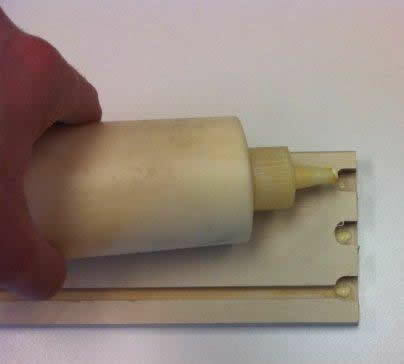 If you apply to much glue, you may create a mess that must be sanded off after the glue dries. 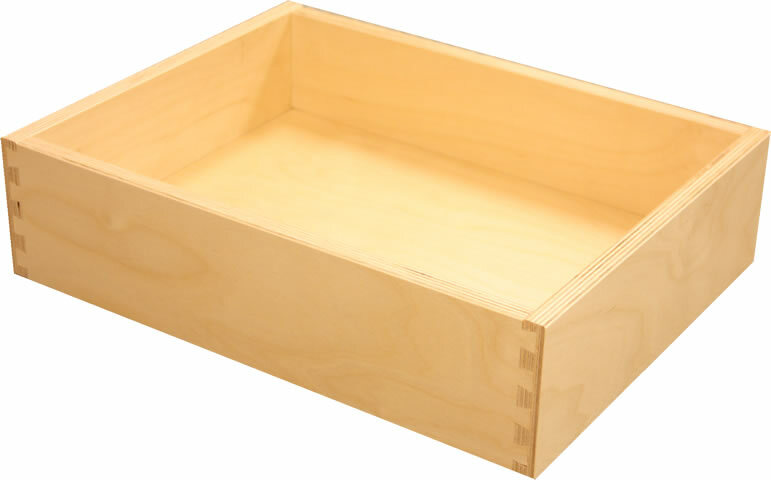 Remember that less is more when working with drawer boxes, the dovetail joints will be very tight and therefore require only the smallest amount of wood glue for decades of normal use. 3. Take one of the sides (it doesn't matter which one) and insert the front of the drawer box into the drawer side as shown below. 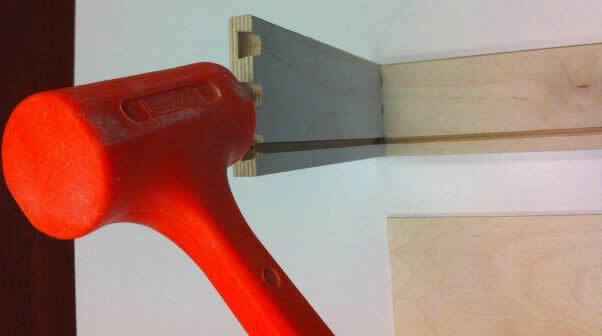 Use a mallet to lightly tap the tow pieces together. 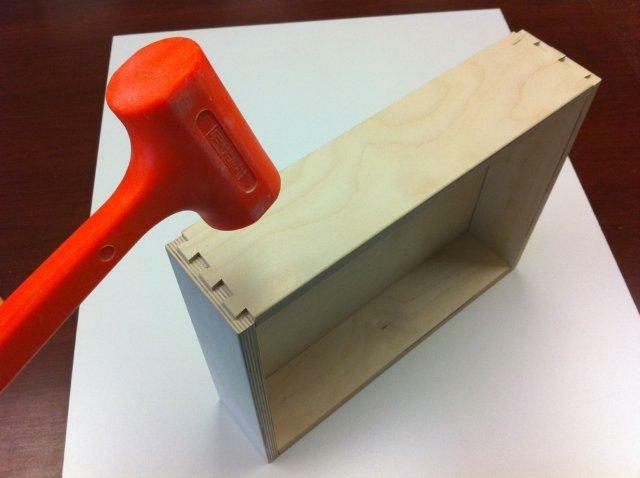 Any light mallet will work, just make sure that you are not using something like a framing hammer in order to avoid damaging the drawer box parts. 4. 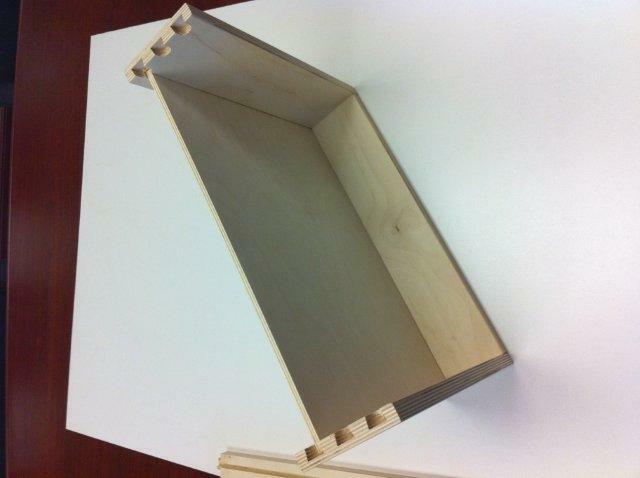 Take the BACK and apply a drop of glue to each dovetail pocket (just like we did with the FRONT). Next, tap the BACK into the side as shown below. 6. 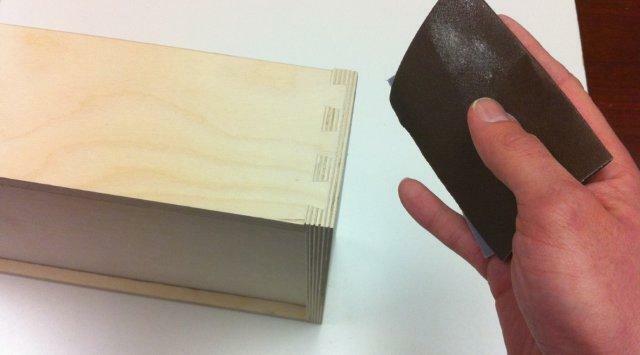 Apply a small dab of glue to each dovetail pocket, then take the last SIDE and lightly tap the joints together. 7. OPTIONAL BUT RECOMMENDED- Now that the drawer box has been fully assembled, you can sand the dovetail joints in order to remove any excess glue and smooth out the joint before you apply your finish. 8. 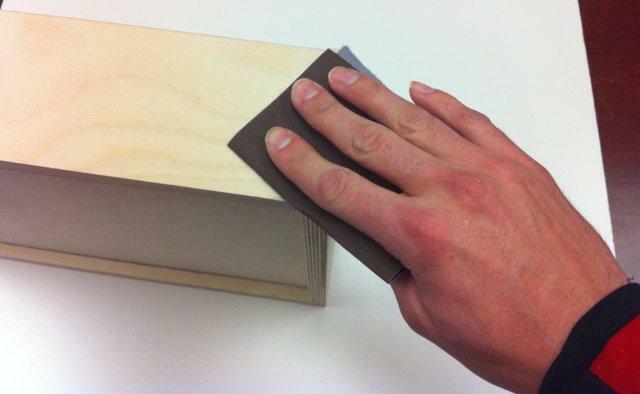 Apply a coat of finish to your drawer boxes.You can use any finish you want in order to finish your drawer boxes. Some customers will spray the drawer boxes with the same stain color that they spray the doors and drawer fronts. Others want to apply a clear coat to the drawer boxes in order to match up better with the cabinet interior. Either way, there is no industry standard that mandates which way you should proceed. 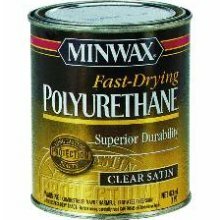 Personally, I like the Minwax fast drying polyurethane. The polyurethane is very durable and in most cases waterproof. For more information on applying a coat of finish to your drawer boxes, please follow the directions on the stain you purchase. 9. 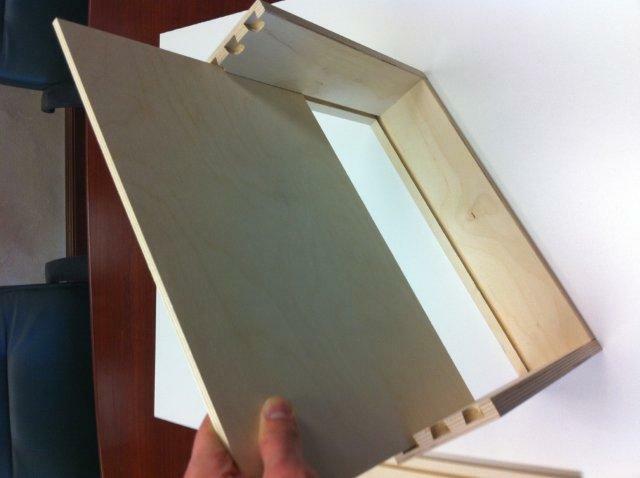 Now that you have sanded and finished the dovetail drawer box you can move on to assembling the cabinet case.